Every day, immigrants in Northwest Queens struggle to find work, obtain legal status, and manage their finances. While immigrant consumers are an integral part of the New York City economy -- spending and saving money and paying taxes -- many face multiple barriers to financial empowerment. This means that many immigrants struggle to build the kind of wealth that could enable them to buy a home, pay for higher education, save for retirement, and lead to overall long-term economic stability and security. While many immigrant consumers do save money, many do not trust mainstream financial institutions because they do not provide linguistically or culturally competent services. Others are concerned about hidden or excessive fees. As a result many immigrant consumers utilize fringe financial services that tend to be predatory and exploitative. 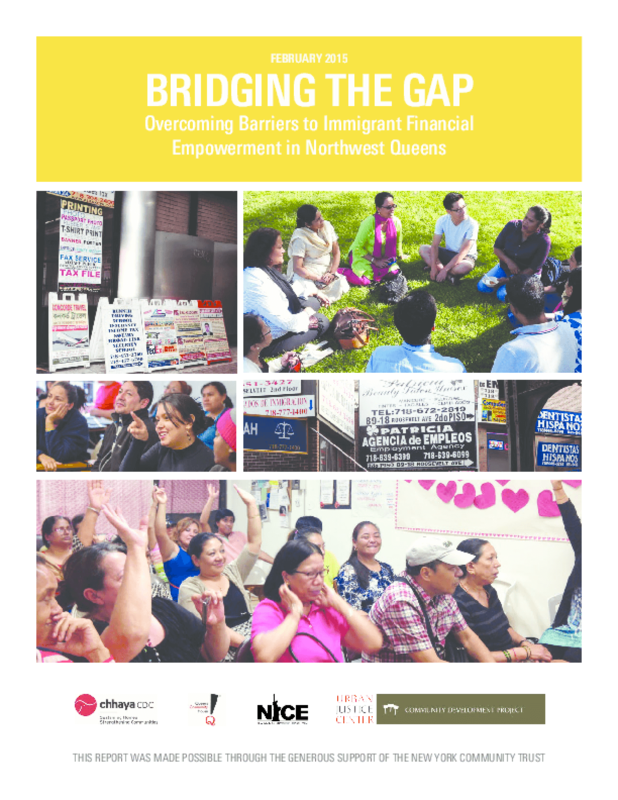 Copyright 2015 Chhaya Community Development, Community Development Project at the Urban Justice Center, New Immigrant Community Empowerment (NICE), Northwest Queens Financial Education Network, Queens Community House.